Writer Henry Beston, who died in 1968, is best known for his 1928 book, “The Outermost House,” in which he chronicled a solitary year spent in a small cabin in the sand dunes of Eastham on Cape Cod. The book, which has never gone out of print and is considered a classic of the genre, shimmers with detailed observations and transcendent reflections reminiscent of the writing of Henry David Thoreau in the previous century. It established Beston’s as an important, contemporary voice in the growing field of nature writing. But in Maine, Beston is also beloved — and perhaps better known — for his later book, “Northern Farm: A Chronicle of Maine.” Published in 1948, it is a series of short essays inspired by his life and observations at Chimney Farm, an 88-acre farm in Nobleboro that Beston and his wife, the late poet Elizabeth Coatsworth, purchased in 1931. “Northern Farm” never enjoyed the popular success of “The Outermost House.” It has long been out of print, except for a facsimile edition published in 2006 to raise funds for the preservation of the farm property, which in 2007 was placed on the National Register of Historic Places. But “Northern Farm” maintains an important position in the canon of environmental writing as well as an affectionate place of honor in many a Maine home library and summer-cottage bookshelf. The first biography of Beston, published last year, sheds light on his trajectory as a writer, on his complex emotional and intellectual responses to the world around him and on his deep connection to Chimney Farm and his adopted state of Maine. 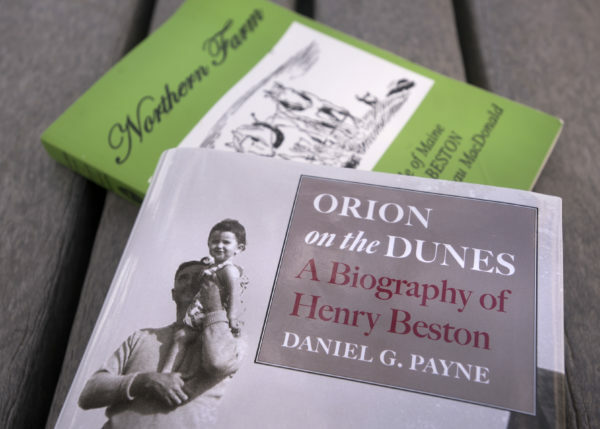 “Orion on the Dunes: A Biography of Henry Beston” tracks Beston from his early childhood in Quincy, Massachusetts, through his death in 1968 at his beloved farm. It tells of his experiences as an ambulance driver and a war correspondent during World War I, his courtship of Coatsworth, his frustration with the politics of the day, his human challenges as a husband and father and his ongoing struggle against depression and world-weariness. More than anything, “Orion on the Dunes” helps us understand Beston’s abiding need to connect at the deepest and loftiest levels with the natural world around him — a need with its roots in his earliest childhood memories and intensified by his wartime experiences as a young man. Beston experienced an almost mystic vision of the natural world’s essential influences, rhythms and truths, Payne said. That vision found its most compelling voice in the solitary reflections of “The Outermost House.” But in the essays in “Northern Farm” — composed over several years as individual submissions to the magazine “The Progressive” — he continued to explore the connections between the manmade world and the natural world as well as the deep satisfactions of simple living and community interactions. Payne, who teaches English at State University of New York College at Oneonta, has a special interest in nature writing — or, as he prefers to call it, literary environmentalism. “The genre has really boomed in the past 40 or 50 years,” he said, inspired by the environmental movement of the 1960s and bolstered by the passage of powerful regulatory reforms such as the Clean Air Act and the Clean Water Act. Along with the classics of Thoreau, Payne’s students read the works of John Burroughs, Aldo Leopold and Rachel Carson as well as Beston and other more contemporary authors such as Edward Abbey, Annie Dillard, Bill McKibben and Robert Finch. Beston’s place among these respected writers and thinkers is secure, he said. After the success of Beston’s first book, we learn in “Orion on the Dunes,” Beston struggled to stay in touch with the ecstatic vision that inspired it. Though his publisher had asked for another book as soon as possible, “there were already telling indications that the quiet, isolated life on the beach that had proved so conducive to writing ‘The Outermost House’ had now lost some of its charm,” Payne wrote. Later that year, Beston’s search to reclaim his inspiration and his literary voice led to Maine, where friends in Damariscotta invited Beston, Coatsworth and their young daughter, Meg, to spend a couple of restorative weeks on their houseboat in Damariscotta Lake. On another visit to Maine in 1931, those same friends showed him a neighboring farmhouse that was for sale. Within a few weeks, Beston and Coatsworth, now with a second daughter, Kate, had purchased the property, eventually naming it Chimney Farm. From that year until his death in the late 1960s, Beston spent long, happy interludes at Chimney Farm. Coatsworth and the two girls came and went more often, dividing their time between the family home in Hingham and traveling to visit friends and family. But for Beston, the farm became increasingly essential to his work and his peace of mind. “Henry spent long periods at the farm by himself,” Payne said. “Usually he stayed from March until November, but sometimes much longer.” His essays in Northern Farm reveal his deepening attachment to the farm, his open affection for his neighbors and friends in the community, and, always, his enchantment and awe at the natural world around him. To research his biography, Payne worked closely with Beston and Coatsworth’s younger daughter, the poet Kate Barnes, who has since died. The introduction was made by their mutual friend, the environmental writer Barry Lopez. At the time, Barnes was living in an old farmhouse on the Appleton Ridge Road in Appleton. Her sister, Meg, was already deceased. “She was so wonderful,” Payne said of Barnes. “She gave me full access to all her father’s papers. It turned into a lot of fun.” Barnes introduced him to others who were knowledgeable about her parents, including the poet Gary Lawless and his partner Beth Leonard, the longtime caretakers and now the owners of Chimney Farm. When Elizabeth Coatsworth died at the farm in 1986, the farmhouse and a few acres were bequeathed to Lawless and Leonard, who also own and operate Gulf of Maine Books in Brunswick. The remaining acreage has been put into conservation easements. Beston, Coatsworth and Barnes are buried in a small private cemetery at the farm, and Beston’s papers have been donated to Bowdoin College. Payne, who is working on a book about the naturalist John Burroughs, said his biography of Henry Beston has been received warmly. One of the most rewarding aspects of writing it, he said, was meeting people who had known Beston and Coatsworth personally and spending time in the natural landscapes that had been so essential to Beston’s vision of the world, including his beloved farm in Maine.